Yesterday was National Puppy Day, which is pretty much the best holiday because dogs. What better time to commemorate one of the--if not the absolute most--famous dogs in history? Charles Schulz's Peanuts comic strip ran for just under half a century. Arguably, Snoopy's popularity eclipsed even that of the ostensible star of the strip, Charlie Brown. (This likely wasn't helped by the decision foisted upon Schulz by the powers-that-be to call the strip "Peanuts" as opposed to "Good Ol' Charlie Brown," but that's a topic for another day). 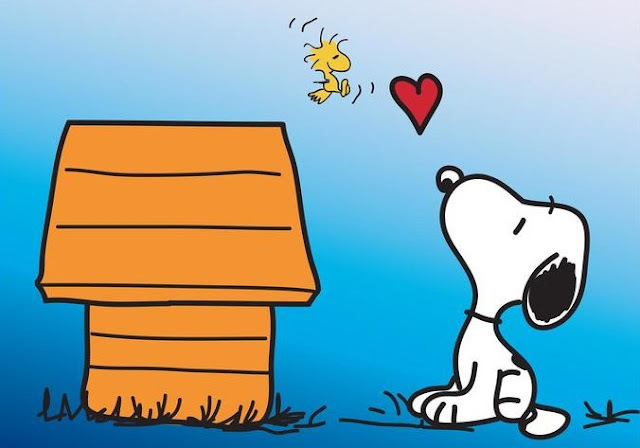 Snoopy, the perennially precocious beagle, retains his popularity even to this day. He has inspired a dedicated locale at Cedar Point, several singles by the Royal Guardsmen, the psychedelic-rock band Sopwith Camel, and even a spacecraft that flew to the Moon. 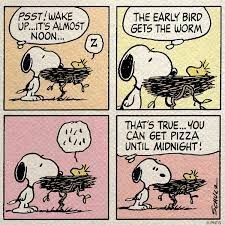 Most people are surely familiar with Snoopy's wisecracks, concealed as they were in-universe from the children around him. It wasn't always this way, believe it or not--Snoopy was originally mute, someone who made himself known by his actions as opposed to his thoughts. One of his first gags came from a strip with no dialogue whatsoever: he had a flower in his collar, and an errant spray from a watering can weighted it down and made it droop. His first words were nonetheless soon to appear, even within the strip's first decade: an incredulous "Can this be true?" when being offered some food. Schulz still took a bit of time before settling on the stereotypical thought-bubble format, but that really didn't matter. Like the rescue dog brought home for the first time, Snoopy had found where he belonged. 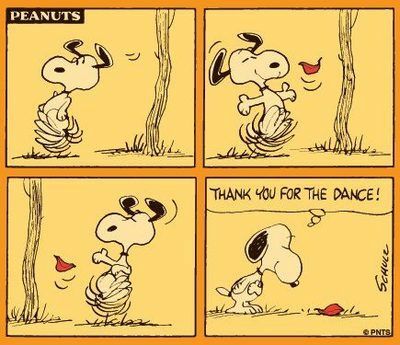 Snoopy is, in some ways, a walking paradox with paws. The strip shows him being both selfish and selfless, spiteful yet sensitive at alternating times. A recurrent gag was written around him not remembering Charlie Brown's name, and his love of supper, if represented in physical form, would give the Burj Khalifa a run for its money in terms of size. Snoopy, though, was not always so self-centered: on at least one occasion, he forewent his dinner because Sally Brown, then a baby, was sleeping on him; his friendship with Woodstock the Unintelligible is well-documented, and the former helped the latter try to find his mother more than once. Snoopy adopted many personas: Joe Cool, Joe Lawyer, the World War I Flying Ace, the world's worst vulture, the local shortstop, the tortured wordsmith. He had a penchant for fine art (even if writing it wasn't his forte), once having owned a Van Gogh, and replacing it with an Andrew Wyeth when the former was lost in a blaze. He also appears to have been an accomplished dancer, not only giving performances in the actual strip itself but also going through mental recitations of routines represented as footprints and arrows. He could sleep on performed sheet music and physically cross out barks he had uttered--Schulz was no stranger to meta gags. 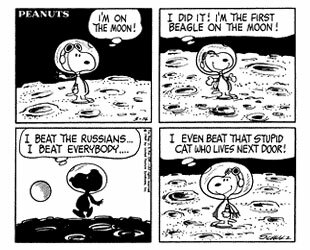 All this goes to show that, ironically, Snoopy may be the most fleshed-out character in the strip. This is not a dig at Schulz or the characterization of his players. While it would be oversimplifying things to pin down the children of Peanuts in one line, there were repeatedly-punctuated notes in their melodies: Charlie Brown was a perennially unlucky everyman; Linus, a pint-sized Socrates; Lucy, the benchwarming fussbudget; Schroeder, High Priest of the Church of Beethoven; Sally, everyone's younger sister; Peppermint Patty and Marcie, the red-oni-blue-oni set of best friends. But while Snoopy was a dog, he wasn't *just* a dog. In a world where children faced the cold reality of life like adults, Snoopy had unfettered, childlike wonder and imagination. He was anything he wanted to be. What do you think? Was I on target or was this post a dark and stormy night? Let me know in the comments!